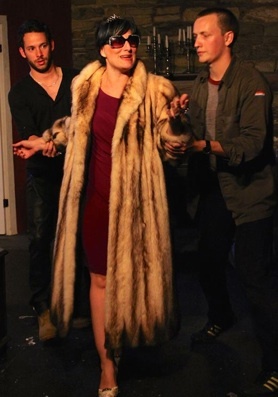 Seven Siblings Theatre is currently presenting the Canadian premiere of Mercury Fur, the most controversial British play of the last decade. When the play by Philip Ridley first appeared in 2005 its subject matter caused outrage among certain critics and Ridley’s own publisher refused to issue the play in print. It has been performed all over the world and received an acclaimed revival in London 2012. Seven Siblings does fine work in bringing this unsettling work to life, but once you look past the play’s immediate shock value, the play seems to have as many flaws as it does virtues. The action takes place in a grungy abandoned apartment in London sometime in a near dystopian future. 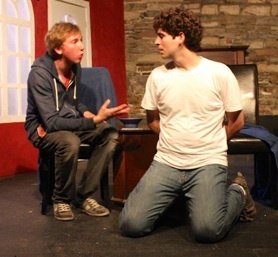 Two young men, Elliot (Cameron Laurie) and his younger brother Darren (Andrew Markowiak) are readying the room for a “Party” that has unexpectedly been moved ahead by four days. In the moral chaos that has ensued, a market has grown for people like Elliot and Darren and their boss Spinx (Mishka Thébaud) to supply wealthy clients with victims to torture and kill just for the thrill of it. The outrage against the original production stemmed from the fact that male victim or “Party Piece” in the play is supposed to be only ten years old. (Kenneth Collins who plays the Party Piece in the current production looks very young but is in his late teens.) Circumstances are barely under control by the time the Party Guest (D. Gingerich) arrives, but they soon go terribly wrong and lead to a devastating conclusion. developed and Elliot is a known butterfly-dealer. The side effect of too much butterfly consumption is memory loss and confusion ranging from an inability to recall individual words to whole swaths of one’s past. Elliot, who has never consumed, is frequently praised as a genius for his wealth of knowledge about ordinary things. Ridley want us to accept as givens the rise of anarchy in Britain and the arrival of the butterflies but does not tell us in what order the two events occurred or if there is causal relationship between them. The future he presents us with is one of casual, horrific slaughter and people who consume butterflies in order to wipe out disturbing memories and distract themselves from what it happening. The prime flaw with the play is that it is overelaborate in light of its principal themes. Those themes are love and memory as they are reflected in Elliot and Darren. The brothers have a kind of ritual they perform to say how much they love each other culminating in the sentence “I love you so much I could burst into flames”. The second theme of memory is perhaps the most fascinating aspect of the play. In a world filled with horror memory becomes a burden as it has with Elliot, yet the destruction of memory through drugs leads to a loss of identity. Ridley’s most inventive idea is to show how people reconstruct the past using whatever materials they have available to them, including movies and other genres of pop culture. Ridley does not actually need the complex sci-fi backstory he uses to explore these themes. Loss of historical memory is happening now and, disturbingly enough, so are thrill killings. Ridley also recruits more characters than are needed to tell his story or develop his central themes. Elliot’s love interest, the transexual Lola (Eric Rich) and the strange blind woman known as the Duchess (Annemieke Wade) are fantastic characters, but are not employed to move the plot forward. In fact, with a cast of eight Ridley oddly undermines the nature of his own setting. Contrary to the supposed anarchy raging outside the apartment, the relations among the eight characters inside the apartment follow a strict hierarchy and events must take place in a strictly observed order. Ridley tells us about the terrors of anarchy but what he shows us on stage are the terrors of order. If one has reservations about the play, there is no denying the high quality of the cast that director Will King has assembled. Cameron Laurie gives a fine performance as Elliot. He gives the character a constant air of worry and mental distraction, which we at first assume is merely related to getting the party ready. As the action progresses both Ridley and Laurie show that there are greater depths of anxiety and moral compromise that Elliot is trying to suppress both for his own sake and especially for the sake of Darren. Elliot says and Laurie makes clear that Elliot has the fullest knowledge of the past of any character and is close to reaching a breaking point from being its sole custodian. s with ease. Despite Darren’s drug-addled thinking, despite his hilariously mangled version of the Kennedy assassination, Markowiak projects such innocence that we look on him as protectively as does Elliot. Markowiak also finely gradates Darren’s reaction when the butterfly Elliot gives him takes hold and when it wears off. By comparison, Adrian Beattie as the neighbour Naz at first seems to be trying too hard to come across as slow-minded especially in such an intimate setting as the Unit 102 stage. Gradually, however, one can accept that this over-eagerness is in fact a sign of his simpleness and by the end Beattie completely wins over our sympathy. Eric Rich played the transsexual Lola as second nature and successfully avoided the trap of cliché. Rich makes us view Lola as the only character other than Elliot with any sense of practicality and it is a relief to find in Lola at least one character who has not become inured to violence. As Spinx, Mishka Thébaud brings an aura of menace with him as soon as he enters the stage and his intensity and resonant voice immediately make him a commanding presence. Annemieke Wade is so fabulous as the Duchess that you forget that the character is not really necessary to the plot. Drugged out of her mind, she holds court accepting any suggestion Spinx gives her as she plays the role of magnanimous aristocrat. Yet, Wade makes the Duchess’s brief awareness of her past life chilling until her account sadly and absurdly begins to blend in with the plot of The Sound of Music. As the Party Piece, Kenneth Collins’s is catatonic for most of the time. Yet, the few times when he snaps awake to experience unknown terrors are extremely unnerving. D. Gingerich is frightening as the Party Guest psyching himself up like a berserker to torture the Party Piece. Mercury Fur has acquired a reputation for being shocking, but there are several British and Irish plays that have struck me as much more disturbing. Sarah Kane’s Blasted (1995) is still the ultimate examination of humanity’s attempt to survive in a world gone mad. For a claustrophobic view of people trapped in a mythic past of their own making, Enda Walsh’s The Walworth Farce (2006) has no peer. And for a glimpse into the minds of a thrill killer, his victim and the arranger of their meeting, Tim Luscombe’s PIG (2013) led one into places of horrific darkness. Nevertheless, Mercury Fur is one of those plays that is still fascinating despite its flaws and is seen by many as a landmark in contemporary British drama. Toronto would be a much poorer place if it did not have adventurous small companies like Seven Siblings willing to stage a play like Mercury Fur, and stage it so well, so that we get to know a playwright like Philip Ridley and judge for ourselves his achievement. Photos: (from top) Cameron Laurie and Eric Rich; Mishka Thébaud, Annemieke Wade and Cameron Laurie; Andrew Markowiak and Adrian Beattie. ©2014 Samantha Falco.